Jay and I took a chance this holiday season. A big chance. 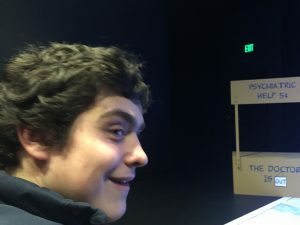 We went to a theatrical presentation with Zack. That’s right. Live theater. 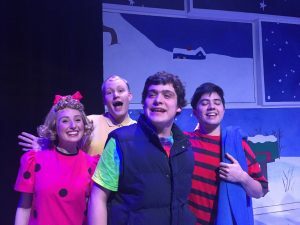 A Charlie Brown Christmas at Taproot Theatre. Two things made it possible for us to take this risk with some certainty it would not be disastrous: 1. We know the people at Taproot Theatre, and they score high on the compassion scale; and 2. The show was only 40 minutes long and designed for people with sensory issues. Designed for sensory issues? What does that mean? Several things: The lights were left on at a low level; the music wasn’t as loud as it usually is; and it was alright to make noise during the show. What else does it mean? 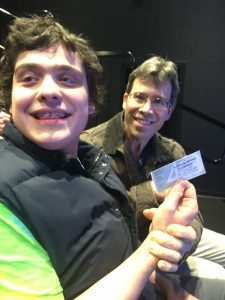 It means that families who never go to the theater together because one or more of their children cannot handle the sensory overload it produces are able to make a memory as an entire family, without anyone left at home. For those with special kids, this means more than can be explained or understood by the general public. Walking toward the theater, we met a friend of mine. I was happy to introduce Zack to Nikki, as I have told her many things about him. That helped put me at ease, because, even with all of the above mentioned factors, I was still on edge about Zack’s performance at this performance! Would he yell in the middle of the show? Would he cover his ears and scream if it got loud? Would he sit still long enough to make it to the end? By the end, tired from shushing and pushing my son’s hands down, I was the one stressed out and overstimulated. But I was also amused and glad that we had somehow managed to do this. No one around us seemed to care about all the noise and movement in our little corner of the audience, and Jay assured me there were other noisemakers that my zeroed-in-mother-ears couldn’t hear. The actors went right on singing and dancing and playing their roles. Zack got his photo taken with them at the end. It was all good. And Zack was happy. He skipped on the way to the car. We made a memory. A holiday memory. Together.